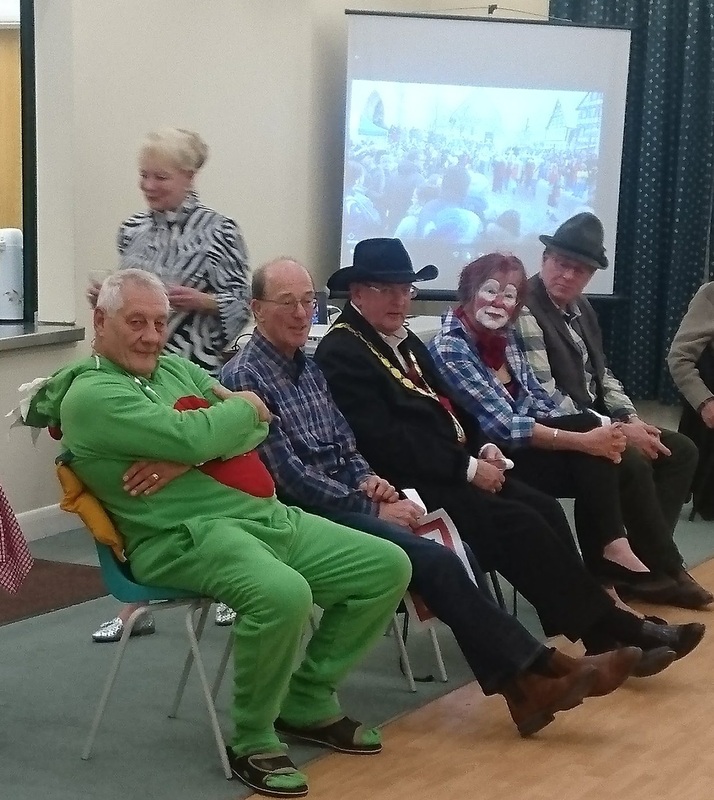 Our Fasching evening last night was a great success enjoyed by many - you should try one of our events! However, We are sorry we have had to cancel this event for local groups scheduled for the 22nd March. 7.30 p.m. FOR 7.45 p.m.
Fasching traditionally begins at exactly 11 minutes past 11 in the morning on the 11th of November, and ends at the stroke of midnight on Shrove Tuesday. 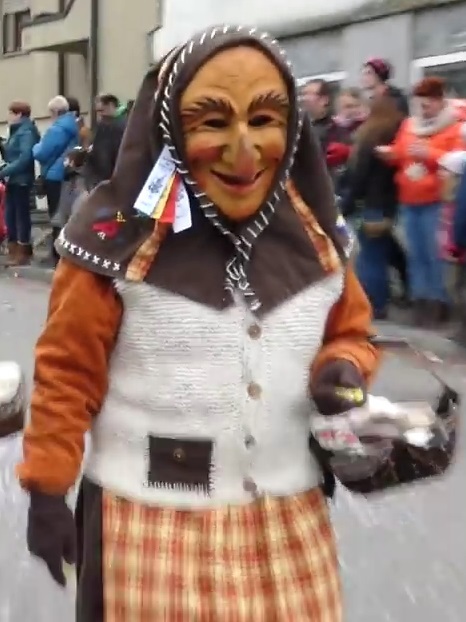 We will give you some detail about this ancient tradition and also have a sampling of some German food. 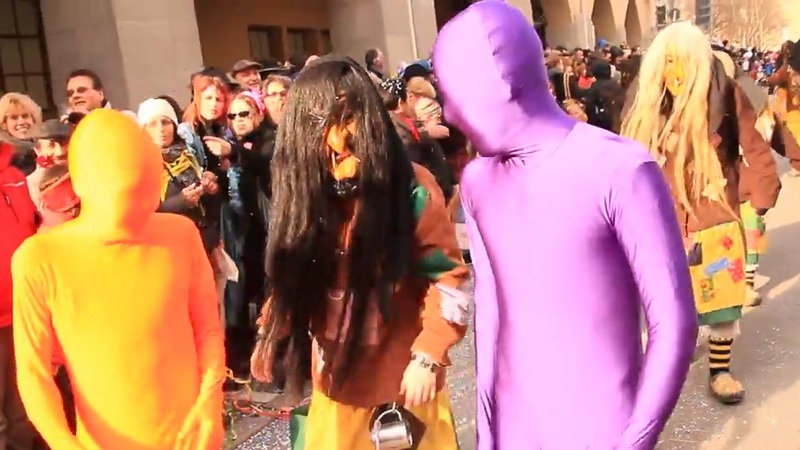 As this is a carnival it is usual to wear fancy dress when watching one of the many parades that take place. Dronfield Town Twinning Federation committee members (some, maybe not all!) 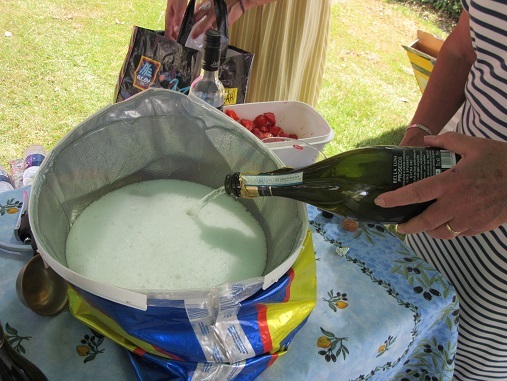 will be embracing this tradition and will be in fancy dress on the evening. If you would like to join in with the dressing up, here are some ideas: animals, kings/queens, super heroes, cowboy/girl, workmen, clown, pirate to name but a few. Feel free to join in with the dressing up - it is not a necessity though - you can just laugh at everyone else!!!! If you would like to come to the evening, please use the "contact us" section on the right, letting us know the number of attendees and any vegetarian needs. – Civic Hall 7:30 p.m. Potential events - we hope to do this. This is in the early planning stage - keep in touch for up-to-date information. We are sorry and give our apologies, because we have had to cancel this event scheduled for the 22nd March. Below is a slideshow including 1 video taken in the centre of Esslingen; giving you an outline of the features of the visit enjoyed by the 31 people who went on our trip in September 2018. 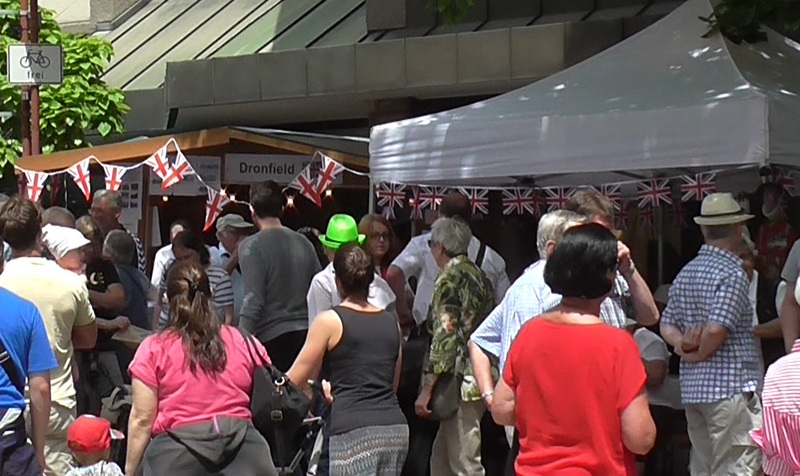 Thanks to all who visited our stall at the Dronfield Gala on Sunday - please keep visiting our website to keep updated. 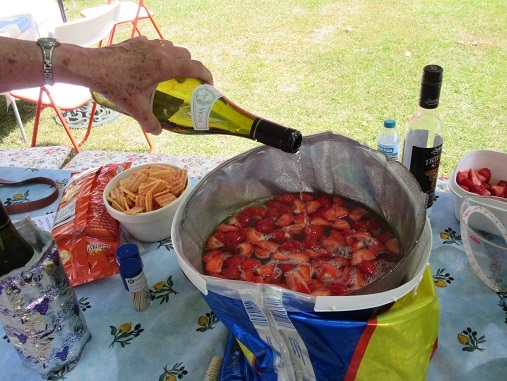 Here's a couple of photos taken during our preparations for serving a typical German summer drink. 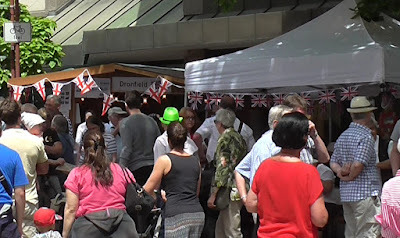 This compiled video should give you a feeling of the event - all taken without a tripod so apologies for some of the video not being as stable as we would have liked. ... and they arrived safely in Sindelfingen - a day earlier than planned! Our committee members David and Neil set off for Sindelfingen on 8th June, just after 9 o'clock - see our earlier post. ... and here they are in the marketplace in Sindelfingen on the 14th, after a total of 524 miles! The photo was taken by a kind German who happened to be passing! In doing this ride, David has been raising money for the new MacMillan Cancer Centre at Chesterfield Royal Hospital. We congratulate them both on a remarkable feat. 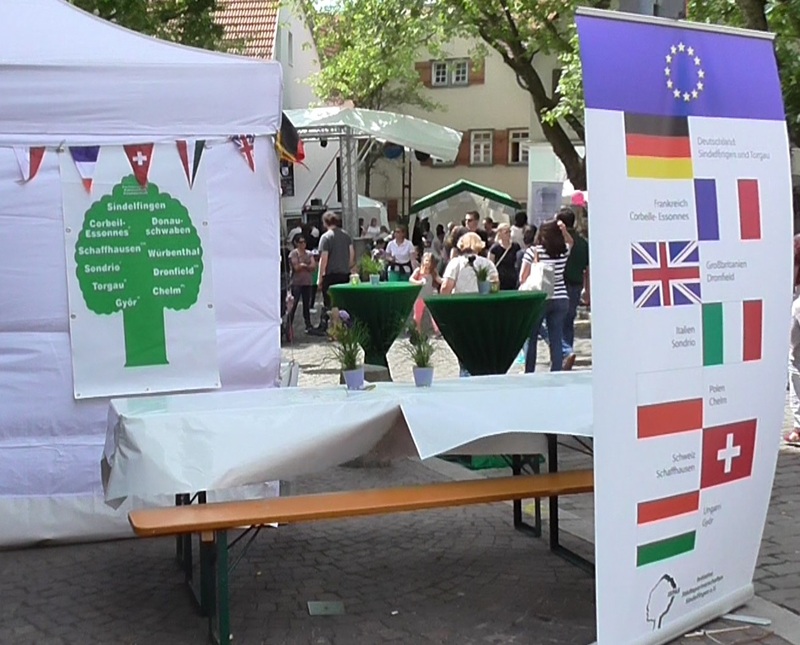 Here are a couple of views of the Strassenfest - an area in the "Twinning Village" and crowds near our stall. 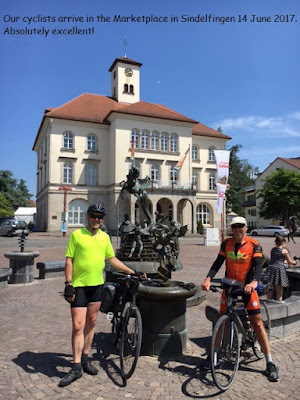 An area of the "Twinning Village"
Here's a photo taken on Thursday, of our cyclists about to set off from the cross in Coal Aston, to ride all the way to Sindelfingen - apart from a pause on the ferry and overnight stops! They'll arrive in Sindelfingen before the Strassenfest weekend begins next Friday..
By contacting us, unless you tell us otherwise in that communication, you are giving your permission for us to contact you - this is to meet the General Data Protection Regulations (GDPR) requirements you’ve most likely had information about from many other sources. We're on Facebook. If you prefer, you can get updates to your Email - Put your Email address below. Get the best from this web site! Calendar - See more detail!